Landscape Temple Books is a publishing vehicle established in September 2003 for the purpose of publishing books in small to medium quantities using Print On Demand (POD) technology. Our primary objective is to publish books that promote a better understanding of social, cultural, environmental or spiritual issues which affect the way we think, live and impact on our planet. Our first publication was "Portal to the Dreamtime" by John Koch. It is an esoteric but easy to read and highly informative work that centres around the first inhabitants of Australia, the Australian Aboriginal people. 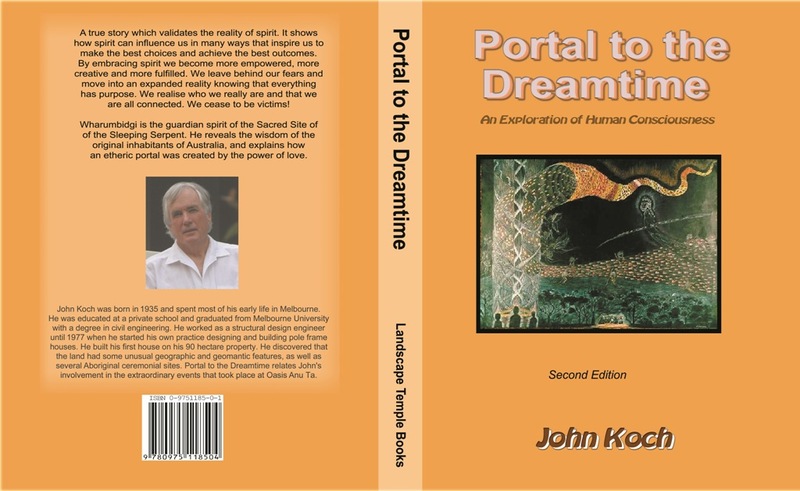 For a brief outline and a review of this book, follow the link to "Portal to the Dreamtime". The first edition published in 2004 is out of print and has been replaced by the second edition sub-titled "An Exploration of Human Consciousness". It deals with the connection between spirit and consciousness, spirit being the source of inspiration and empowerment. The concept is supported by compelling evidence provided by true events. At this time the world is clearly in crisis both environmentally and socially. This is the result of humanity's almost exclusive immersion into the physical reality and the consequent denial of spirit. The book puts forward the case for a change in our belief systems and explains why and how this can be achieved. The 2015 edition includes about 30 black and white photos and other images. The price is $35 + $15 packaging and delivery within Australia for single copy. The book can be purchased directly from John Koch by contacting me by phone, e-mail or post. Retailers should contact me regarding wholesale purchase. Portal to the Dreamtime has also been published by Xlibris and is available via www.portaltothedreamtime.com.au This version is in full colour and contains additional information such as preface, author's biography and index. It can be purchased from the publisher and on-line book stores such as Amazon and Barnes & Noble, or directly from the author ($48 + $15 packaging and delivery within Australia for single copy). PORTAL TO THE DREAMTIME IS ALSO AVAILABLE FOR DOWNLOAD IN E-BOOK FORMAT BY APPLICATION TO THE AUTHOR ($15.00). The many man-made problems facing the world are all due to our beliefs and the consequent activities stemming from those beliefs. These problems can never be finally resolved by military force, negotiation, litigation, political or religious reform, economic policy or technology. They can only be resolved by modifying our beliefs. Humanity is diverse with a diversity of belief systems, but there is one thing most of us have in common. We are so deeply immersed in the material world that our view of reality has become severely restricted. Over thousands of years our consciousness has evolved, but it has also remained limited. We have become so seduced by the attractions of wealth and power, and by the expediency and comforts offered by science and technology, that we see only the physical reality. We have lost the knowledge of who we truly are. The Australian aboriginal people, before the arrival of Europeans, did not have this problem. They knew that they were spirit, and they acknowledged the spirit in all things. They could communicate with spirit and be guided by it. Their spiritual culture enabled them to live successfully and harmoniously amongst themselves and with their environment for well over 40,000 years. The story of Portal to the Dreamtime provides compelling evidence that we are not just physical beings but we are also spirit. To some people that is an accepted truth. However, the bulk of humanity remains in denial, and the consequences have been devastating. The book logically explains how we can become more empowered and change things for the good of all, simply by embracing spirit as part of our reality. Such a process of change can be challenging, but also hugely rewarding. It can open the door to a new paradigm, one based on love rather than fear. Contact us at 21 Stanmore Avenue, Somers, Victoria, Australia.